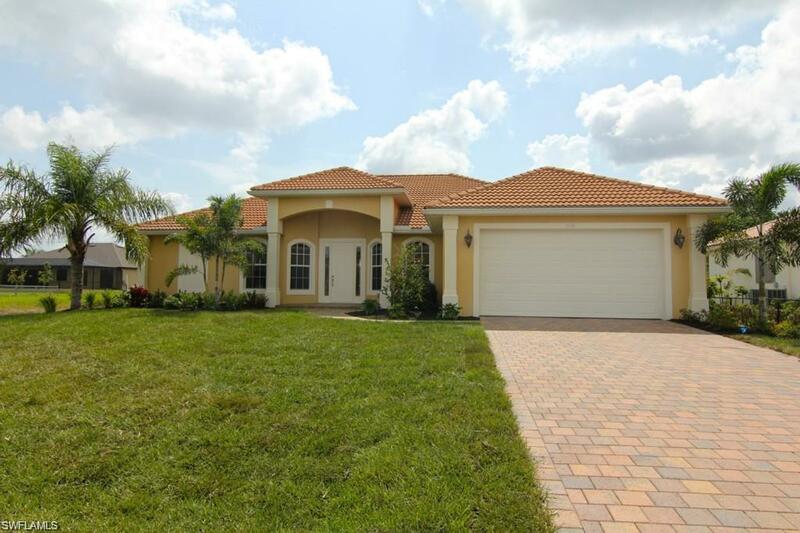 ONE OF THE BEST PRICED 4 BEDROOM 3 BATHS POOL HOME WITH OVER 2300 LIVING AREA AND WESTERN EXPOSURE WITH BRICK PAVER DRIVEWAY. BRAND NEW AIR-CONDITIONER JUST INSTALLED AND ROOF WAS JUST POWER WASHED.. Stunning Western Exposure SW Cape Pool home across from Gulf Access Homes near Million Dollar Homes. Amazing price for this home, once inside you will call it home. This Like new home offers 4 Bedrooms 3BR + Den with closet Plus an additional Mini-Suite attached to one of the guest bedrooms its like having 2 master bedrooms. Master bedroom is large with tray ceilings large master suite with double sinks, walk in shower soaking tub and Bidet. Home is pre-wired for surround sound, has Central Vacuum, Tile Roof, In-ground Sprinklers. With over 2300 living area This home has a fantastic layout. Kitchen has granite counters, wood cabinets, stainless steel appliances. All new landscaping just installed. large screened in lanai with in ground pool. On city water and sewer. Home is just like new.